Let's face it: Your bathroom gets pretty gross. 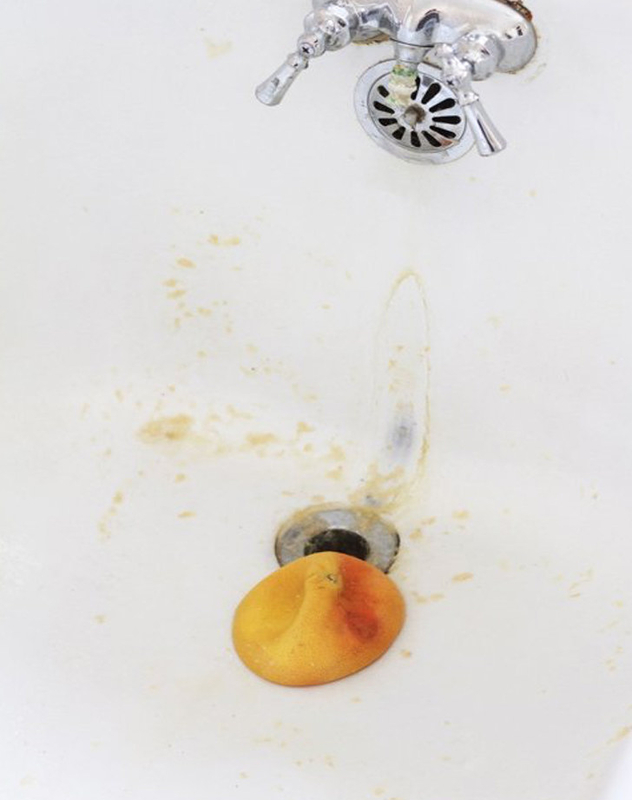 From rings in the toilet to gunk on the shower door, here are 13 easy tricks and tips for cleaning all that unwanted bacteria and grime. 1. 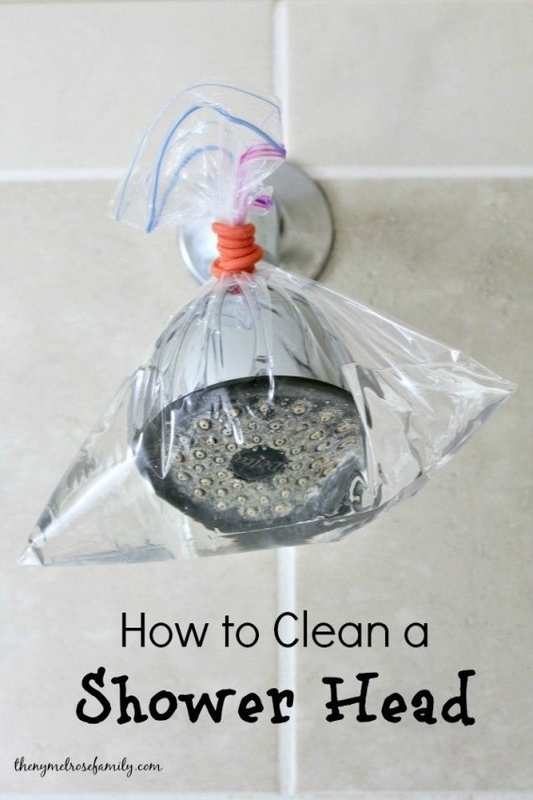 Clean your shower head with white vinegar and a plastic bag. Without even noticing it, your shower head can get pretty gross. We learned from blog, Melrose Family, that you can fill a plastic bag with vinegar and wrap it around the shower head with a rubber band. 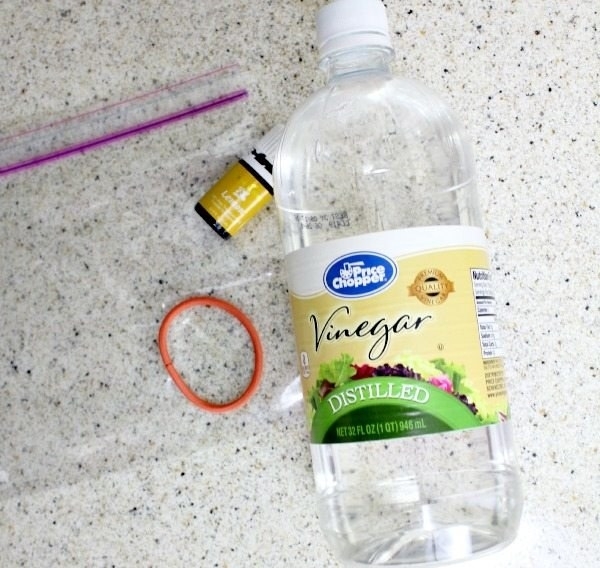 Leave it for an hour or two, then remove the bag and turn on the water for a few minutes to clear out the vinegar. 2. Use black tea to naturally clean medicine cabinet mirrors. Steep three or four black tea bags in boiling water. 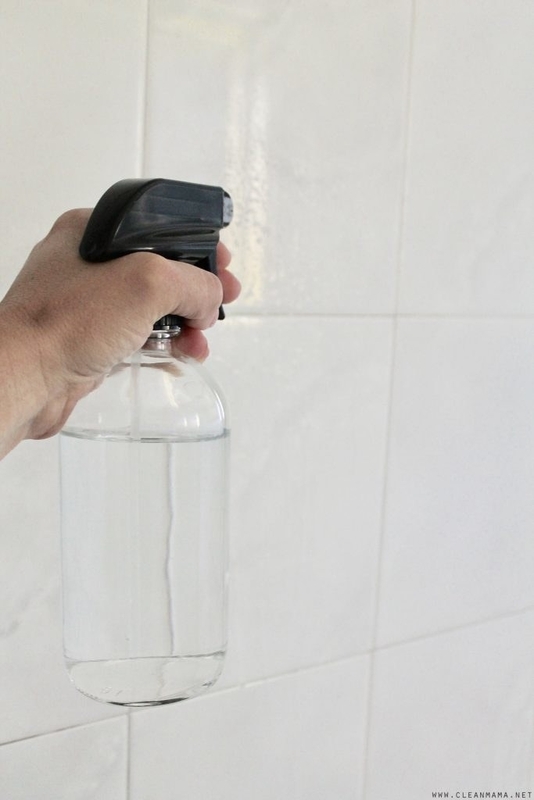 Let the water cool and transfer it to a spray bottle. Then you can use the tea and water solution to naturally clean your dirty bathroom mirrors. 3. 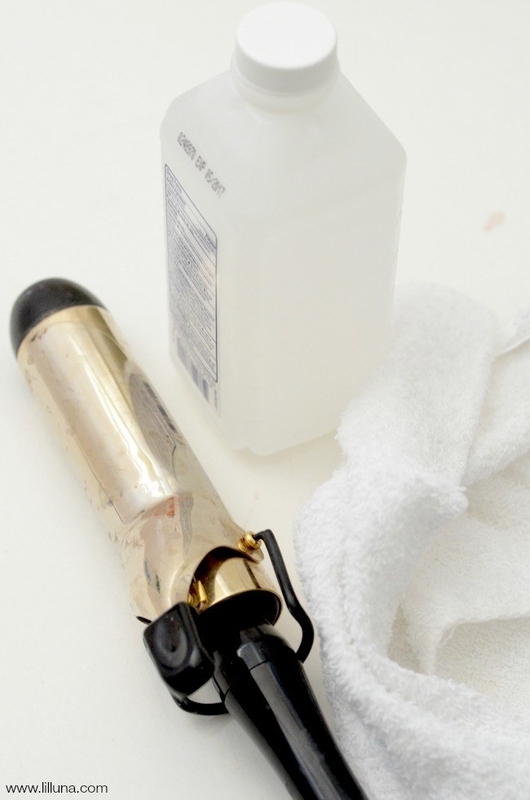 Clean your straightening and curling iron with rubbing alcohol. 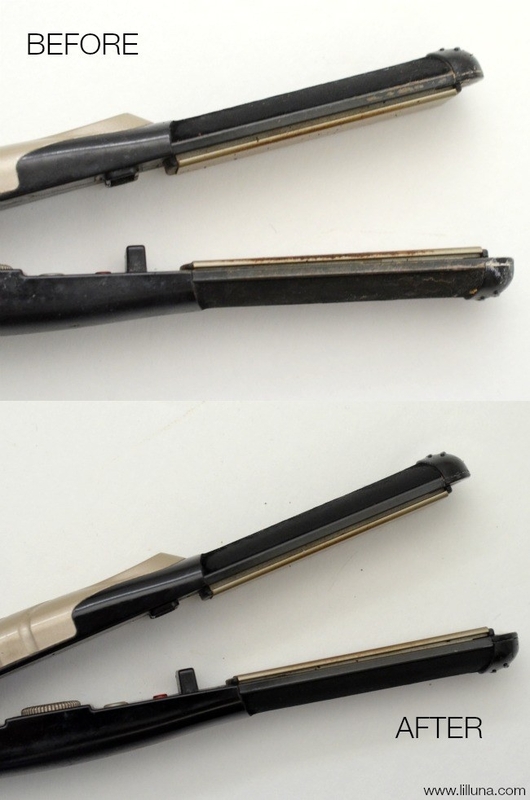 After a while, your straightening and curling irons can build up gunk. As Lil' Luna explains, make them good as new again by dabbing a washcloth with some rubbing alcohol and running the cloth up and down the iron. Just make sure the iron is completely cool (and off!) when you clean it. 4. Hang a shoe organizer over your bathroom door to keep all your beauty items in one place. Maximize a small space by folding a plastic or mesh shoe hanger on the back of the bathroom door. Then you can organize all of your beauty products and toiletries so they're all in one easy-to-find place. 5. 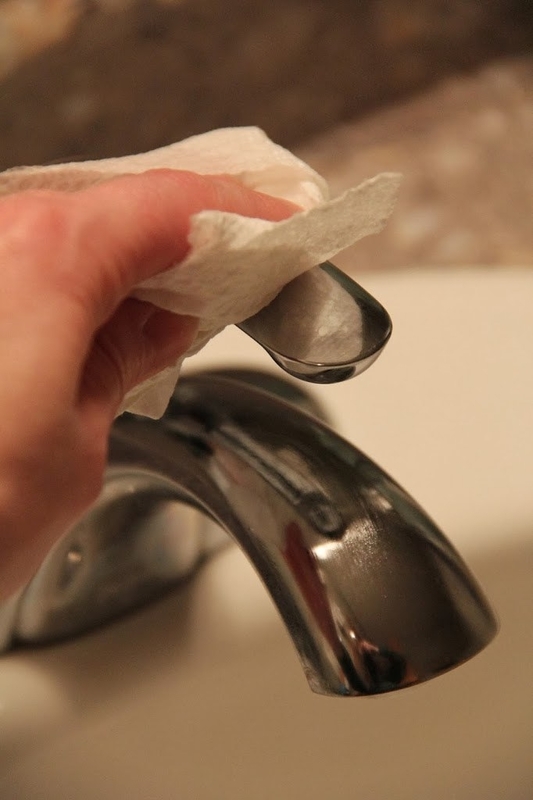 Use a combination of vodka and baking soda to combat any grimy spots in your bathroom. 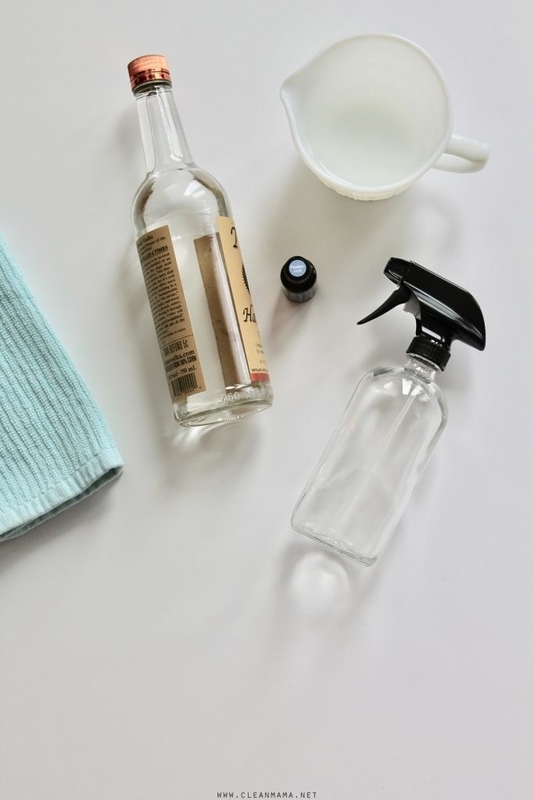 We saw on Clean Mama that we can combine equal parts vodka and water to make a general disinfecting spray you can use on bathroom floors, counters, and even those dirty crevices behind the toilet. We like to add essential oils to make the spray smell fresh and clean. 6. 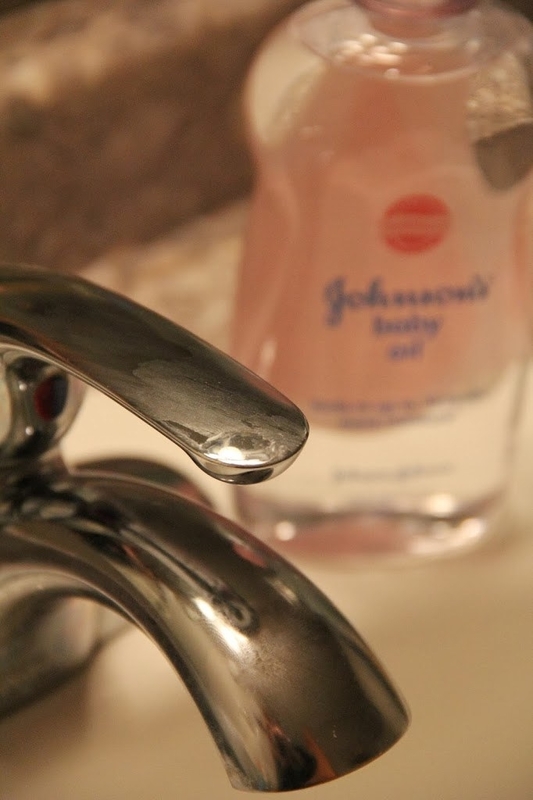 Apply baby oil to clean metal faucets. Even if you don't have a newborn around, baby oil can come in handy around the house. We learned from Bitz 'n' Giggles how to use warm water and a cloth to wipe down metal surfaces like faucets and other hardware. Then add a drop of baby oil and rub it all over the metal for shine. 7. And try a pumice stone to make your toilet cleaner than it has ever been. Turns out, pumice stones can be used for far more than pedicures. 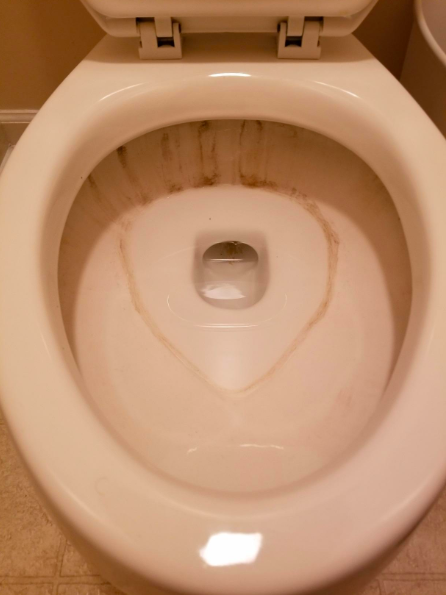 It's a natural and cheap way to clean those hard-to-remove rings that form in your toilet bowl. First, grab a pair of cleaning gloves and then get scrubbing. 8. 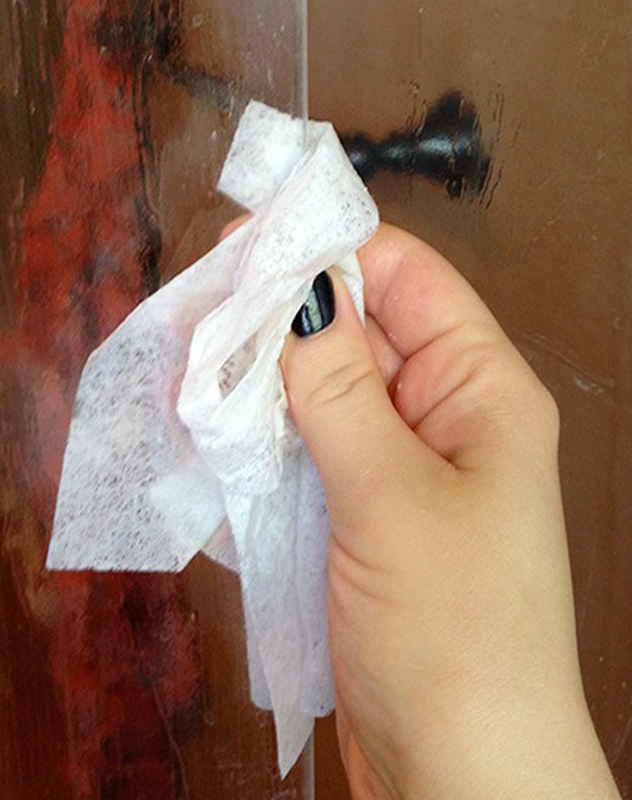 Use a dryer sheet to clean soap scum on bath and shower doors. 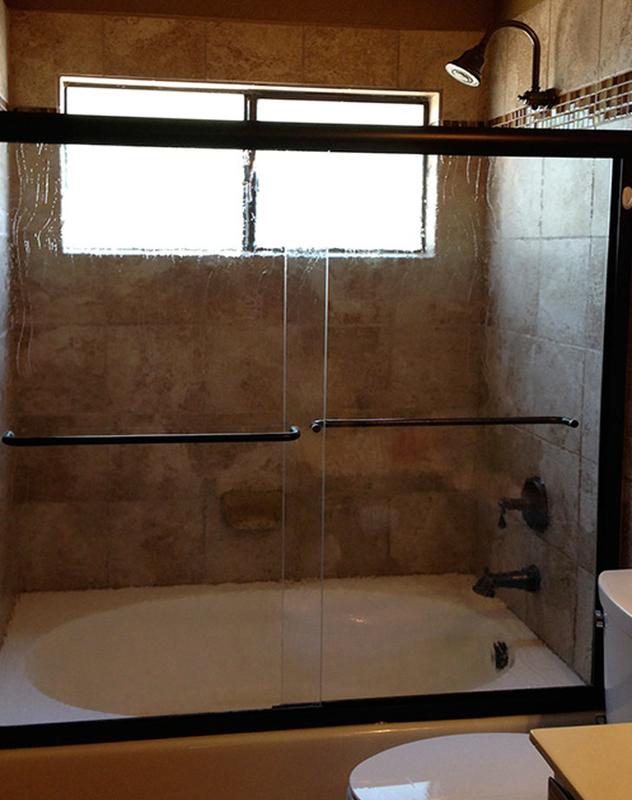 If you have a glass shower door, you'll know those white stains that appear all over the surface. They're just dried soap and water marks, but they look pretty nasty. To make them disappear, Everyday Simple suggested weting a couple of dryer sheets and go scrubbing on those shower doors. Then, give them a final rinse with water. 9. Or try using a Magic Eraser. Like a sponge but even better, a single Magic Eraser sponge will do wonders on your shower doors. 10. Clean your toilet brush with bleach. You probably choose not to think about how dirty your toilet brush it, but that thing needs a good clean every once in a while. For a painless method, try Clean Mama's bleach trick. 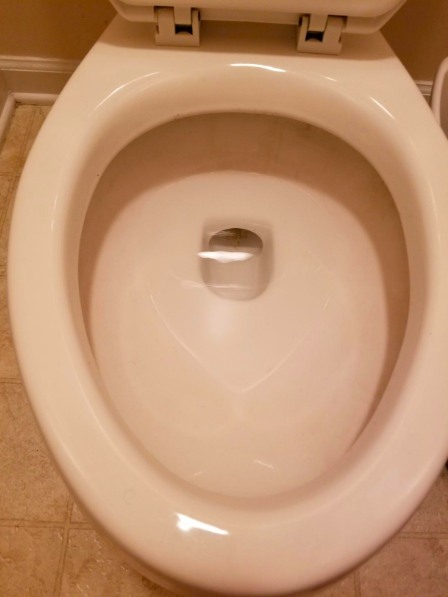 First, flush your toilet bowl a few times so the water is clean, add a cap-full of bleach, and let your toilet brush sit in the water for an hour or so. Just make sure to let the brush dry before storing it back in its holder. 11. 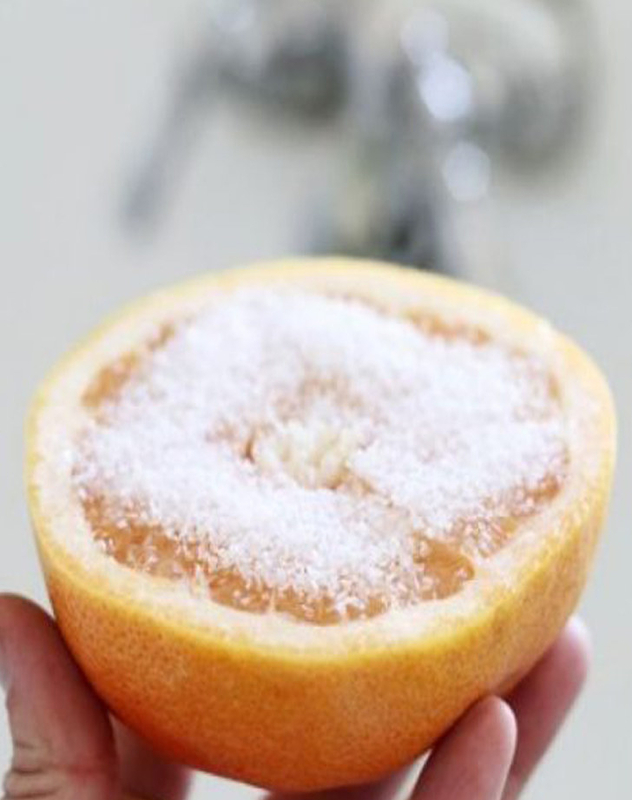 Clean your bathtub the natural way with grapefruit and salt. You don't really need any chemicals to clean your bathtub and leave it smelling fresh. As we learned from Apartment Therapy, just cut a grapefruit in half, generously sprinkle it with salt, and start scrubbing the dirty surfaces in your bath tub. When you're done, just rinse away the juice and pulp. 12. Or use dish soap and a broom. We learned a great lazy hack from One Good Thing By Jillee: If you want to clean your tub without stepping foot inside of it, grab a broom, some Dawn dish soap, and get to work. Just squirt the dish soap at the bottom of the tub and use the broom to scrub all over. The soap and the bristles will fight all the dirt, mold, and build-up in your tub. 13. Sanitize your shower curtains with vinegar in the washing machine. You wash your towels and your bath mats, but it's easy to forget about your shower curtain. Whether plastic or linen, they collect dirt and mold from your tub. Bitz n Giggles has the step-by-step instructions for giving your shower curtains a good cleaning. Pop them into the washing machine with warm water combined with distilled white vinegar. Now go from your bathroom to the kitchen by learning these silverware cleaning hacks!